Used with permission from Stars and Stripes®, ©Stars and Stripes 2003. Many jeep collectors today understand the closeness of the cavalry sergeant to his mount. They work painstakingly to return the jeep to a drivable condition and some even complete factory restorations. 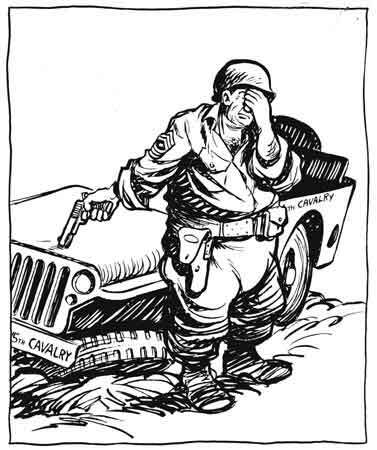 The vehicle is revered as much today as it was during WW2 as exemplified in Bill Mauldin’s cartoon. In 2002 Stars and Stripes® paid tribute to Bill Mauldin’s work. Unfortunately, it doesn’t appear that you can view it online any longer. However, you can find the jeep in a number of his cartoons in books that are still available.